This morning, while proofreading one of the the funnier comics in the newspapers, I had to look up the spellings of old-school board games such as Mousetrap, Chutes & Ladders, and of course, Candy Land. 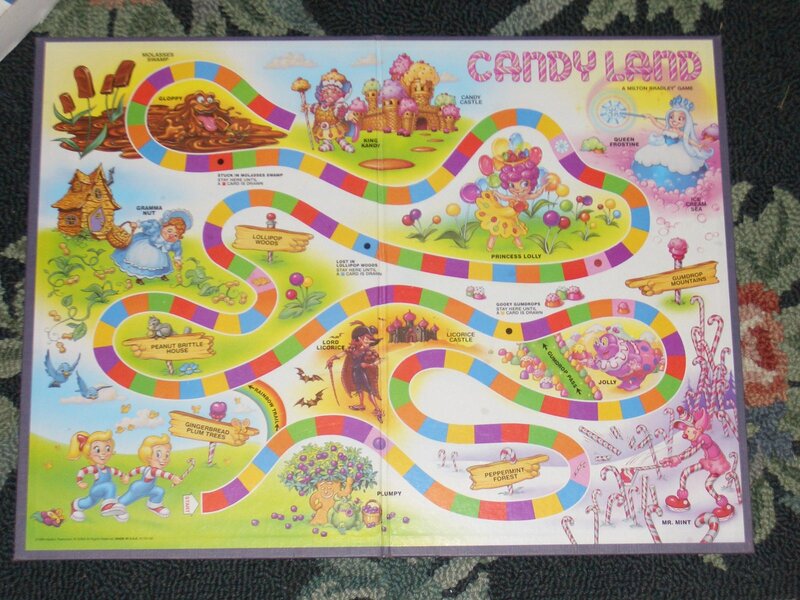 The google image result for Candy Land brought up a large map of the Candylandscape circa the 1978 edition. I thought of the Wizard of Oz movies or Willy Wonka as I let my mind wander back through the Lollipop Woods, the Ice Cream Sea, the Mollases Swamp. I looked at each landmark and remembered my childhood. But I also wondered why the picture was so quilted-looking before I read the caption and saw some lady had meticulously constructed it out of 100,000 tiny beads. The dedication this artist put into the project was as astounding as the end result. It also made me realize that Candy Land serves as a spiritual homeland for many more people than just me, as this image I found on flickr demonstrates. A web search revealed that Candy Land was invented in 1940 in San Diego by Elanor Abbott, a woman recovering from Polio. Hasbro (which bought Milton Bradley) had to sue in order to retrieve the domain name http://www.candyland.com from the operators of an adult Web site. 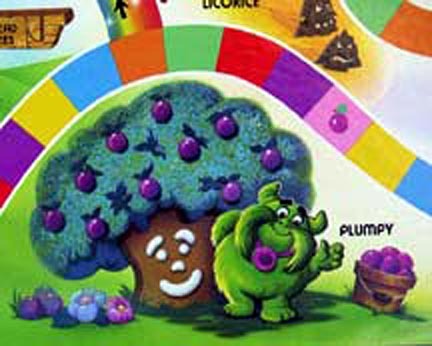 I also learned that Plumpy the Plumpa Troll was replaced by Mama Gingertree, reportedly for unknown reasons. The more I looked, however, the more clear it became that Plumpy had over the decades become the personfication of bad luck for thousands of highly sensitive and impressionable young children. For those of you who forget (or never played) the game is played by choosing cards and advancing to that place on the board. The winner is the first one who gets to the castle at the end. Daniel was very intense as he played, and kept getting flustered by “Plumpy” Plumpy is the card in the deck that sends you back almost to the beginning. No one likes Plumpy, but I think of the game as a highly evolved, spiritual game, in that it lets us know what we can control (taking turns, not cheating) but is like life, in that there is much we cannot control, like love, or birth or death. So, when a Candyland player is going along, and is suddenly swept up to the Queen Frostine card, or cast down to the little plum, Plumpy, then that is a lesson in things we cannot control. For children, much of their lives are involve things over which they have no control: where they live, who their teachers are, whether their parents get divorced, or stay together, etc. Another article, this one written by the mother of a young girl, seemed to take it personally every time her daughter was dealt the unfortunate “plump” card (a sort-of reverse trump card), which sent the girl into a state of despair. That said, the main trouble with Candyland, in my opinion, is not the win-lose scenario. It’s Plumpy. Seriously, I really do think that Plumpy is responsible for a good deal of the rising Prozac trade. With Plumpy in action, a game of Candyland can last as long as the Dark Ages. Maybe longer. As soon as you approach the final curve of the path, Plumpy will rise from the depths of the card pile and send you packing your bags back to the sugarplum trees. After about six encounters with him, most parents are ready to ring his fuzzy little neck. Normally I would seek a response from Plumpy’s people, but his contact information and board game profile have been scrubbed. Even the wikipedia text that had come up when I searched for him the first time had vanished from all but the cached version of the entry. All we know for sure is that Plumpy was replaced by Mama Gingertree. So what does that tell us? Most likely, replacing scapegoat Plumpy with a matriarchal character was the result of recent developments in child psychology. Or perhaps the collective resentment against Plumpy had built into a multi-generational groundswell, and a simple change of face was needed in order to denote a more self-aware / refined era of board game. In other words, somebody had to take the fall, and that someone had to be Plumpy. Another possibility is that Hasbro is guilty of displaying the same chromatic prejudice as when McDonald’s Corporation gave Grimace the dreaded “purple” slip. Or maybe Ma Gingertree just has that certain spice — a game industry executive’s fatal weakness for redheads, perhaps. A long shot, and yet Hasbro has been conspicuously silent on the matter. Whatever the reasons, as history has taught us, there are grave consequences to deposing public figures for political expedience. Also worth considering is whether this “new switcheroo” of gender and fortune suggests that this country may, in fact, be ready for a female president. Certainly the circumstances attending Plumpy’s downfall invite further discussion. But let us end instead with a salutation to the now-departed Plumpster himself: Plumpy, you may have been kicked out of Candy Land, but there’s certainly a place for you in Plumpa Troll Paradise. I’m so confused. I linked to the 1978 board from this page; I believe this was the board I grew up with, and Plumpy wasn’t represented. I had no recall of him, so no surprise there. What’s up? My name does appear on the candy land game . I want to know why my name disappear.